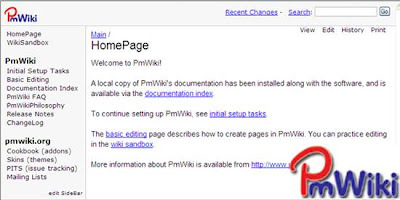 PmWiki is a free wiki software for collaboratively creation and maintenance of websites. it's wiki software written in PHP programming language and specially designed for Multi author website. it mainly focus on usability, so people with little knowledge about wiki and other technology can easily operate and manage the pmwiki software. PmWiki pages are like normal web pages, except they have an "Edit" link that makes it easy to modify existing pages and add new pages into the website, using basic editing rules. You do not need to know or use any HTML or CSS. Page editing can be left open to the public or restricted to small groups of authors. Customizable application interface : User can quickly change the appearance and functions of a PmWiki site by using different skins and HTML templates. you can create your own skins or modify any readymade skins to meet your requirement. Access control : PmWiki password protection can be applied to an entire site, to groups of pages, or to individual pages. Password protection controls who can read pages, edit pages, and upload attachments. PmWiki's access control system is completely self-contained, but it can also work in conjunction with existing password databases, such as .htaccess, LDAP servers, and MySQL databases. Customization and plugin architecture : PmWiki follows a simple design philosophy with the main objectives of easy to use and easy to install, maintainability, and keeping non-required features out of the core distribution of the software.